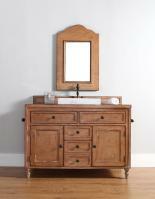 This bureau style vanity base has a handsome traditional style that will be great asset to the bathroom. The single sink size still provides good space for the countertop area and storage space. The seven drawers will make organizing the space a breeze. The top one is a tip out style that keeps small items close at hand. The bottom of the base is an open shelf for added storage room. The wood material this piece is created from has a light warm honey alder finish. This tone is accented by the dark shade of the rustic iron hardware pulls. 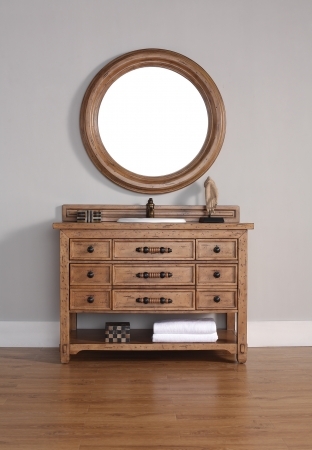 The center drawers have wood turned handles for an added decorative effect. The wood backsplash is included and matches the piece perfectly. There are several options separately available for the countertop to best match the look to the existing dÈcor. 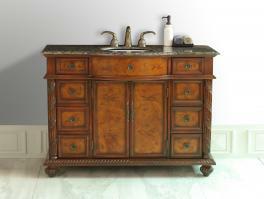 This solid vanity will be a welcome addition to the space and will be appreciated for many years to come.